I was hoping that this recap was going to have some other players to discuss, but the guys that Michigan got is nothing to turn your nose up at. They will be big impact guys, maybe not right away (not including Jabrill Peppers), but down the road they will contribute. Here’s the outlook for the offensive players for this class in case you missed it. And here is an outlook for the 2015 class of the recruits they are targeting and how many players they make take for each position. On a separate note, I wanna know how much Comcast paid to get XFinity put on all these Signing Day logos for a day. 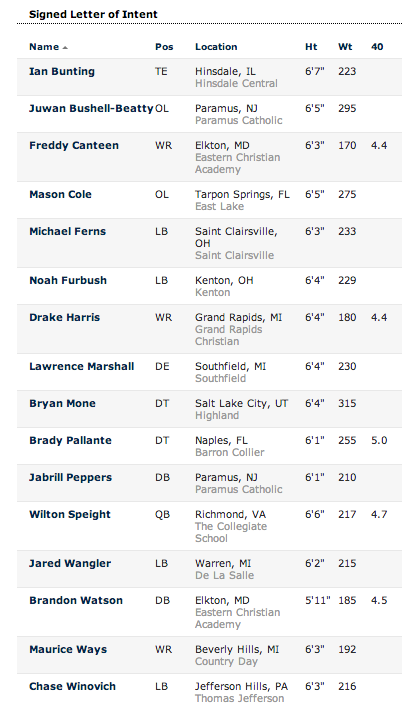 I really can’t wait to see what Greg Mattison will do with these players. They’re all athletic and all have a lot of potential. Michael Ferns (Early Enrollee): The first commit of the 2014 class and he’s been committed since August 9th, 2012, which is absurd. Ferns is an absolute machine at linebacker that has great instincts and makes plays. He’s got great power and speed and his early enrollment should help him get on the field early, even with the multitude of young linebackers ahead of him. Noah Furbush (Early Enrollee): An absolutely massive linebacker with some serious intensity. Read the tweet below and you’ll understand what I mean. He hits hard while using his quickness to avoid blockers and even possesses the ability to drop back in coverage. He won’t be a one-dimensional linebacker that has to come out on passing downs. Will probably end up redshirting next year. Lawrence Marshall: Marshall is an athletic edge rusher with a high motor and possesses an elite ability to get to the passer. He may be a little undersized, but he more than makes up for it with his athletic ability. I expect Marshall to get in on the defensive end rotation next year, especially after the issues Michigan had rushing the passer. Bryan Mone (Early Enrollee): Mone is absolutely massive, coming in at 6’4″ 315 lbs as a freshman is incredible. He has elite size and strength and will fit in nicely on the defensive line for Michigan. He does a great job clogging the middle against the run and has a bright future as a three-tech. Mone should be playing early next year with the defensive line depth issues and because of the fact he’s already in school. Brady Pallante: Originally a greyshirt, Pallante was offered a scholarship after it was determined by the coaches that they weren’t going to get any other players. I truly don’t know much about Pallante other than the fact he used to be a wrestler and is very good at getting off blocks and getting leverage in the trenches. Pallante will definitely redshirt and will be an interesting player to see how he develops. Jabrill Peppers: Peppers is the crown jewel of this class and he can literally do it all. I fully expect Peppers to start in the nickel next year, but he will get reps at cornerback and probably safety. It also wouldn’t surprise me to see him return kicks or punts and get a few touches on offense. Peppers is a playmaker and needs the ball in his hands. He’s been compared to Charles Woodson quite a bit and I expect to see Peppers wearing the legendary #2 someday. Peppers was a high-impact player at the Under Armour All-American game and took a lot of snaps out of the wildcat. He’s going to be a playmaker and a fan favorite from Day 1. Jared Wangler: Wanger is a smart, instinctive player that is very good in coverage. Obviously the smallest of the linebackers, coming in at 6’1″ 220 lbs, but that doesn’t stop him from being a sure-tackler. Wangler should redshirt next year and it will be interesting to see how he develops. Wangler will have plenty of time to develop as a player with the depth in front of him. Brandon Watson (Early Enrollee): Watson was teammates with Freddy Canteen and seemed to be a package deal. Upon further review though, you can see he’s a solid cornerback with good tackling ability and he likes to gamble. He makes plays on the ball and has no trouble coming up to the line of scrimmage to help make a tackle. He’ll likely redshirt next year but will have an impact in the future. Chase Winovich: The fourth linebacker of this massive linebacking group and Winovich is another big boy. He has great pursuit ability and hits like a truck. He’ll be an outside linebacker that will be able to drop in coverage on tight ends and make some plays. Is it August yet? Go Blue. This entry was posted in College Football and tagged 24/7, Brady Hoke, Brady Pallante, Brandon Watson, Bryan Mone, Chase Winovich, espn, Greg Mattison, Jabrill Peppers, Jared Wangler, Lawrence Marshall, Michael Ferns, Michigan Football, Michigan Wolverines, Noah Furbush, Rivals, Scout. Bookmark the permalink.